Herbert Lawson was born in Foston c1883. His father Joseph was an agricultural worker but also held the posts of sexton and parish (church) clerk; a position that had been in the family for generations. They lived in Church Street (Main Street end). At 18 Herbert was a groom at 8 St Peters Hill, Grantham (now the Town and Country Club) for James Eaton, surgeon. He then joined the Army, serving for 8 years including a year in Africa (possibly during the Boer War), finishing as a Lance Sergeant. By 1911 he was the drill instructor at Borlase School, in Marlow, Bucks and boarding in West St.
During the Great War he enlisted in the Army at Marlow and joined B Company, 2nd Battalion, Lincolnshire Regiment. He was sent to the Western Front in 1916. In March 1917 (during the German retreat to the Hindenburg Line) gunshot wounds fractured his left arm, necessitating amputation. He died of wounds on 25th March, aged 34 and was buried in Bois Guillaume Communal Cemetery (associated with No.8 General Hospital). Joseph’s younger brother (Herbert’s uncle) Archer (Titch) Lawson was injured when he was 17 and had to use crutches thereafter. However, he continued to work on the farm (Firs Farm for G Burton) until he died in 1952, aged 71 in the house he’d been born in, having lived there his whole life. Another brother, Thomas Lawson, moved to Grantham where he worked for Frederick Fletcher Ltd, Wine & Spirit merchants of Westgate for 43 years. He died at 152 Dudley Rd in 1940 (age 69). 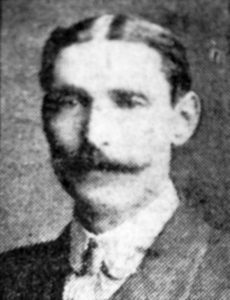 Joseph’s half-brother, John W Wand, was born in Bourne in 1865, moving to Foston when his mother Annie Wand married Joseph’s father (also Joseph) in 1867. 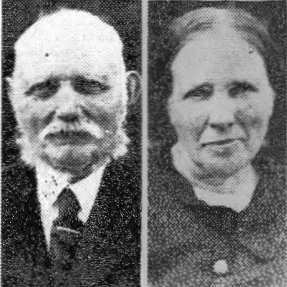 John married Mary North in 1885 and they celebrated their golden wedding in 1935. John died in Foston in 1948, aged 83. Their elder son (also John W) served on the Western Front during the Great War.